We are counted among some of the reliable industries engaged in offering a comprehensive assortment of Advertising Signage Material to our clients at leading prices in the market. These products are in great demand these days for their long service life and excellent designing. The products are manufactured using high quality raw material procured from the reliable vendors of the industry. They are quality tested several times to ensure 100% client satisfaction. The designs are very catchy and colors used are very bright. We hold specialization in offering a broad array of Acrylic Sheets to the patrons. These products are obtained from trusted manufacturers, who use premium quality raw material in the production process. We offer these sheets in thickness ranging from 1 mm to 100 mm and more than 250 colors. Available in varied textures, shapes and colors, these sheets can filter and transmit ultraviolet light. 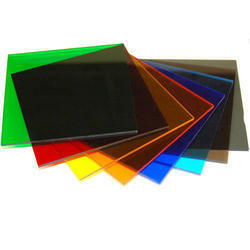 Acrylic Sheet is widely used in the commercial sectors like skylights, diffusers, light covers. Its growing popularity has made its impact in building, signboards and houses. Discovery of new uses has provided avenues for a wide range of products. Control Panels, Display Screens, Holders, Monitor Screens, etc. Signage, Commercial Signs, direction signs, directory signs, display panels, embossed signs, free standing signs, suspended signs, etc. Screens – Motorcycle helmet visors, noise barriers, office partitions, pool partitions, wind screens etc. It weighs half as much as the finest optical glass. The sheet offers superior clarity (92% light transmission for colorless material) and excellent weather ability.